Last year, John Ridley won an Oscar for his 12 Years a Slave screenplay, which he adapted from a memoir by Solomon Northrup. Given the formal structure of that work, Ridley’s Jimi: All Is By My Side — which he both wrote and directed — comes as a surprise, a spontaneous-feeling work that focuses on a tumultuous year in the guitarist’s life. All is By My Side reflects the taste of Hendrix’s time, a moment when moviegoers flocked to films that felt as if they were expanding experience, showing what it was like to travel in certain circles. That immersive late ’60s quality and a fine performance by Outkasts’s Andre Benjamin make All is By My Side a dizzying introduction to the scene that swirled around the enigmatic Hendrix from 1966-67. Hendrix was nothing if not elusive: He could be poetic, brutal, childish or daring. A musical genius, he refused classification, but played well enough to reduce the great Eric Clapton to quivering silence during a now-famous London jam session. Benjamin captures Hendrix’s naivety, alienation and charm. It’s a performance full of suggestion and charisma, the kind of star power Hendrix learns to use to his advantage. He’s the coolest guy in just about any room, and increasingly, he knows it. It’s misguided to think of All is By My Side as a bio-pic. Its scenes emerge and vanish like smoke, re-creating a creative and chaotic pop-cultural aura. 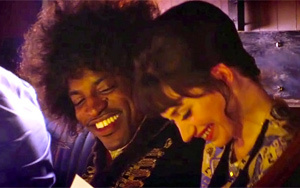 Ridley does, however, include biographical elements: Hendrix was discovered by Linda Keith (a terrific Imogen Poots) at a New York club. Keith Richards’ girlfriend at the time, Keith sees Hendrix’s star potential, something he has yet to grasp. Keith introduces Hendrix to Chas Chandler (Andrew Buckley), a member of The Animals who’s thinking about shifting gears. He wants to manage rock stars. Chandler takes Hendrix to London, where the music scene percolates with energy. There, Hendrix establishes a sometimes volatile relationship with a woman named Kathy (Hayley Atwell). Kathy loves him, but eventually learns that no one ever will possess Hendrix. Stability may not have been in his nature. There are great scenes in the movie that seem to come out of nowhere. To open a Saville Theatre concert, Hendrix decides to play Sgt. Pepper’s Lonely Hearts Club Band. The expectation is that he’ll offend the Beatles, several of whom happened to be in attendance. Ridley wasn’t able to obtain rights to Hendrix’s original recordings, so he had to use substitute musicians. That may explain why we don’t learn enough about how Hendrix developed his amazing talent, but Ridely gives the movie a sense of immediacy that makes up for the deficiency. Hendrix’s band was called the Jimi Hendrix Experience: I don’t know what sort of legal difficulties might have been involved, but the band’s name would have made a better title than All is By My Side. It’s also a fine description of what you’ll get from Ridley’s drifting recreation of a lost moment: Here for the taking is a Jimi Hendrix experience.